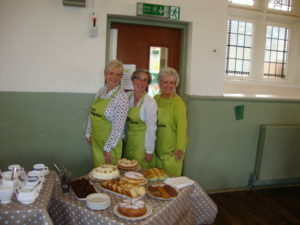 On July 31st, In Bloom Judging Day, the Lydgate Stitchers hosted a Coffee Morning in the Parish Hall. 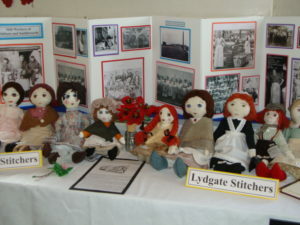 Their wonderful work was on display, including a piece of Art Work by local Artist Jill Harrison, which will form the basis of their next wall hanging and also some dolls which will be part of the Love Lydgate History Project. and also some dolls which will be part of the Love Lydgate History Project. With donations and a raffle £100 was raised to pay for the rental of the Parish Hall and materials. Anyone is welcome to join the Stitchers, just contact Celia on cedavies54@yahoo.co.uk and she will tell you when their next meeting will be. Thank you to all who supported us on the day. It was lovely to see old friends and make new ones. 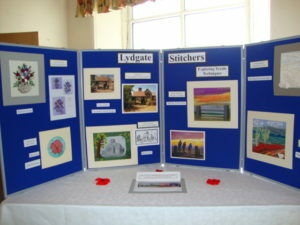 Who Are The Lydgate Stitchers?